You can wait until you've actually installed the windows to run the numbers, but unless you have copius amounts of glazing you're probably setting yourself up for an unhappy result. So what is a reasonable value for Tvis? Your first assumption might be to notice that the "minimum Tvis" values for daylight glazing is 0.7, while the minimums all other glazing is 0.4. To be clear, these are not required minimums! You could potentially have a giant room made of nothing but Kalwall with a Tvis of something like .15 and still get the daylighting point. The "minimums" are really poorly named, as they are more like benchmarks of light transmission performance. The higher visible transmittance you have the better off your daylighting factor becomes. Another thing that will help is to know that visible transmittance described by LEED as "Tvis" is frequently listed in different ways. I've seen VLT, VT, and other similar configurations. It's listed as a percentage or a decimal with about equal frequency. Pella uses a "VLT%" and lists whole numbers. A "53" rating for their products yields a 0.53 rating for LEED. Pella - Put in your zip code and then go to the list that says "Document Types" and select "U-factor, Solar Heat Gain Coefficient..."
Anderson - Anderson lists their VT ratings under the "Performance" tab of the basic product description page. If you have a site to add covering Tvis please let us know in the comments section! LEED CS folks look out! For some reason the USGBC has left off a valuable tool from the LEED-CS credit pages on LEED-Online for EQc8.1 and EQc8.2! 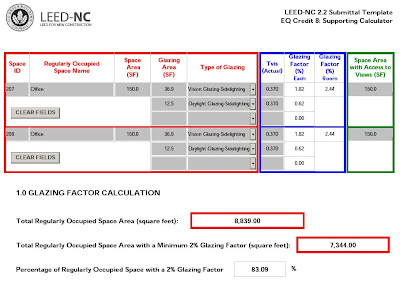 On the LEED-NC projects there is a VERY helpful EQc8 Credit Calculator for you to use that can be found on those pages. The CS and NC requirements are the same for these points with the exception of developing a feasible tenant layout. It's an interactive PDF that adds up all your square footage room by room and then runs the calculations for both EQc8 credits. All you have to do is input the glazing square footage, the Tvis, and where it's located (vision sidelight, daylight sidelight, skylight, etc.) and it will tell you where you stand. The EQc8 Supporting Calculator can be found here!!! 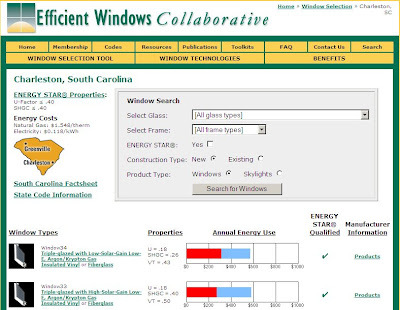 The link will direct you to the LEED-NC sample credit templates for Environmental Quality. You will need to extract all of them and toss the rest. The file you want is EQc8-SupportingCalculator. great info. our project has a research greenhouse on the top floor which is clad in double-skin high impact acylic - the product we're looking at has a light transmittance of 86% (!) but is given as T D65 on some of the manufacturer specs. (perhaps for the type of light filtering)- any thoughts on greenhouses in LEED? Percentage of the incident visible light that passes through an object. By this definition, could this value be interchanged with Tvis? I found that computering modeling (e.g., AGI 3.2) gave a FAR more accurate calculation of daylight factor than the calculation tables from LEED. Using the tables (with the ACTUAL ACTUAL Tvis of the glazing) gave me a MUCH lower DF for all the spaces (I could not meet the minimum requirements of the LEED-CI v.2.0 8.1/8.2 credit.) Computer calculations gave me a minimum of 25 footcandles in over 90% of the spaces, and verifying this with the lightmeter in the finished project showed even high levels (noon/clear sky/equinox) in 90% of the spaces. But if you have a consultant (lighting designer or electrical engineer) on a project who has run LIGHTING calculations (as part of the regular lighting design) they have probably already built a model of the space in something like AGI 3.2 of LumenMicro, and would probably, for a slight fee, run daylighting calcs in addition. Filo... I'm not sure that you can take advantage of interior glazing in the same way as exterior glazing using the calculation method. More advanced strategies such as glazed offices around the core may need to run the computer model or use actual measurements. Anyone else try this before? Joe, that was my fear. To account for depth of space. Post comments here if find a reasonable approach to this. i will do the same. I was in touch with you last week regarding the web relocation of the LEED-EB documentation. Thanks for the credit! In your first comment to this thread you write that the minimum Tvis does not have to be what is listed in the book (i.e. 0.7 or 0.4). For the daylight factor calculation if I do not use the listed minimum Tvis what figure would I use? Please elaborate. Your answer could change my entire way of thinking about this credit. I’ve been assuming that if I don’t have an actual Tvis of 0.6 (60%) or higher I probably won’t achieve the 2% daylight factor. Being able to change the figure I use in the calculation for minimum Tvis might prove favorable. I can answer that question for you. You can achieve the daylight point with glazing that has a lower Tvis than the minimums. The minimum Tvis values of .4 and .7 in the calculation basically act as a weighting factor to make lower Tvis glass less ideal. Any glazing you put in can help achieve this point. For example, if you have windows that are above 7'6" that have a Tvis of less than .7, they can definitely still help achieve this credit, but they won't help AS MUCH as a .7 window. I almost always run the calculations to make sure. Unless you have very small windows, or rooms without windows, you may have a chance. Another benefit of running the calcs is if you are early in design, they will help you know if you can achieve the point by adjusting window sizes, or moving to a slightly higher Tvis. This isn't related, but on a Core and Shell note, you do not have to perform a Feasible Tenant Layout for the Daylighting credit, only for Views. You can actually do the daylighting calculations in the shell using the open floor. I ended up on this site because I too am on a wild-LEED-goose-chase. Filo, go ahead and skip this credit and spend your client's money elsewhere. I hope you are bothered that you are being forced by the LEED gurus to spend time (blogging, energy modeling, etc) justifying why a design with interior glazing will help improve occupant experience/satisfaction. Hasn't anyone at USGBC ever heard the phrase, "you'd make a better door than a window"? The phrase is used to tell someone that they're blocking a view. Hello, I can't see through you! I suppose the wild-LEED-goose-chase gives the green economy something to do. LEED = greenjob...right? Saving the world one inconsequential daylighting study at a time...for a SMALL FEE...right? How much is that daylighting study really worth to your client if it's purpose is not to inform the design, but merely to qualify for a LEED point. Would the interior space/lighting design be "better" with solid walls Filo? Does your client really care about the daylight factor as long as they get daylight and a nice space? As a client, the only reason I would willingly pay someone to perform a daylighting calculation is if I believed it would save me "real" money or it would not be possible to design the same quality of space without it. Same goes for LEED; it's a waste of the client's money. Hi, Love your site. I'm trying to fill in the EQc8 calculator, but how do I enter two types of windows for the same space? Also, I seem to be having problems: I can enter the name of the space and sq. ft., but it won't let me fill in any more information. What am I doing wrong? Anonymous, I know you're probably not watching this thread any more, but it seems to me that EQc8 has synergies with thermal comfort, energy use, and ventilation, so an owner who was the type of owner who wanted to pursue a LEED certified building in the first place is probably an owner who understands that it's the balance of the competing strategies that makes a great green building. PS Thank you for this info, very useful! Does anyone know if medical exam rooms can be excluded from the "regularly occupied space" amount? I am working on a building that includes several rooms that will be used for conducting medical exams, but is not a healthcare facility. The provision of daylight via windows would be not be appropriate since privacy is a priority. I haven't found anything in the CIR database indicating that this would be okay. ok basic question more for personal verification - what's your method to measure window glazing for this credit? if you have a very small percentage of your regularly occupied space that is sensitive to daylight (e.g. you have certain lab equipment or a dark room for developing photographs), then you can exclude it. If it makes up a large percentage of your program area, then USGBC tells you to pursue another credit - this isn't for you. If you wrote a CIR, the USGBC would tell you that you can still provide daylight via translucent glazing or clearstory windows, and you can therefore still protect your patients' privacy. You do not have a good justification for excluding the patient rooms exam rooms. I don't know how to fill out the template for interior office windows where the lighting comes from a skylight in the hallway. Can you offer any advice? In the reference guide of CI v2 it states that "window areas above 7'6" are considered to be daylight glazing....windows areas from 2'6" to 7'6" are considered to be vision glazing." When they say "window area" they mean your window height correct? So if my windows are greater than 7'6" in height they are considered daylight glazings correct? I have some glass cut sheets that give the "Visible Light Transmittance" as 75% and the window cut sheets (the window contains the glass from above) that give a "Visible Transmittance Total Window" of 0.549. Which one should we be using as the Actual Tvis in the Daylight Factor Calculation? Hey Joel, just an FYI for the readers/specifiers out there -- if your project can afford it, a glazing system like PPG Solarban 70XL Clear offers a Tvis of 74% while still maintaining a SHGC of only .27. COOL!